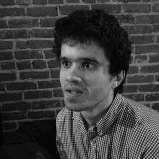 Adam Strauss lives in Las Vegas, and has a full-length collection of poems For Days, out with BlazeVox press, poems in the recently released anthology The Arcadia Project (Ahsahta Press), as well as poems out in Word For/Word, the Laurel Review, Spork and Interim, and Verse. Douse her throat in spangles. Cancel each to each in the elegance of an X. A condensation from its hot, concentrated sense. Intuition can't counter nor concur. Finally, now. By these terms, by the urns of diluvia turned dialectical—cross of arcana, plausible topography and self-cancelling chiasmus—there are no ways for me to wriggle, which does not suit my sense of self-importance and is, thus, more even than the trials and jackings of struggles for literacy, most inopportune, to the point where, I'd like to believe you agree, you're glad there's an elk less than two hundred miles away from where we are.